"Setting" may be too mild a word for the presence of the landscape in these five fictional works, all of which quite literally "take place" in the soil of western Virginia. Nearly forgotten today, these writers developed their plots of love, war, and madness from their own experiences in and around the Shenandoah Valley. Henry Ruffner published Judith Bensaddi while serving as the sixth president of Washington College (now Washington and Lee University) from 1836 to 1848. One of the earliest American novels to deal with the status of Jews in the United States, Judith Bensaddi also deserves notice for its accurate and extensive portrayal of the area around Rockbridge County, Virginia, with which Ruffner was intimately familiar. George Tucker. The Valley of Shenandoah; or, Memoirs of the Graysons. New York: Charles Wiley, 1824. Barrett Library. Author of the first authorized biography of Thomas Jefferson (2 vols., 1837) as well as the first complete History of the United States (4 vols., 1856-1857), George Tucker represented his Shenandoah district in the U.S. House of Representatives from 1819 to 1824, after which he joined the faculty of the University of Virginia at the invitation of Thomas Jefferson. In The Valley of Shenandoah (1824), the first of his three novels, Tucker describes a typical Shenandoah Valley deer hunt. John Pendleton Kennedy. Horse-Shoe Robinson: A Tale of the Tory Ascendency. Philadelphia: Carey, Lea and Blanchard, 1835. A lawyer and legislator before turning to fiction, John Pendleton Kennedy was the author of three novels: Swallow Barn (1832), Horse-Shoe Robinson (1835) and Rob of the Bowl (1838). Kennedy shared with Washington Irving a desire to extol the American landscape, and Horse-Shoe Robinson, which is set in Virginia and the Carolinas during the Revolutionary War, reflects his encounters with the scenery of western Virginia during the summers of his youth. Although the first eleven chapters are largely a prologue to the main narrative, their Blue Ridge Mountain setting provides important introductory information, so much that Kennedy found it necessary to begin the novel with a "Topographical Discourse" outlining the native scenery. Nathaniel Beverley Tucker (Edward William Sydney, pseud.). The Partisan Leader; A Tale of the Future. Washington: Printed by D. Green, 1836. False publication information given: Washington: Printed for the Publishers, by J. Caxton, 1856. Shown: Chapter 1. Son of poet St. George Tucker and relative of historian and novelist George Tucker, Nathaniel Beverley Tucker spent his professional life as a professor of law and political philosophy at the College of William and Mary. 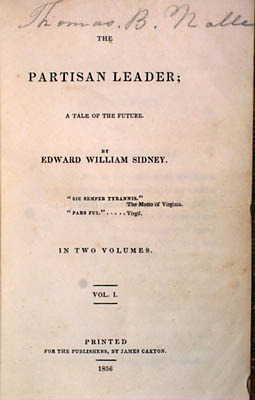 The Partisan Leader, which he published with a fictitious imprint date of 1856 under the pseudonym Edward William Sidney, presciently predicts that federal interference with states' rights may result in southern secession or civil war. The novel also features a fine chapter in which a young tenderfoot learns to appreciate the difference between his own aesthetic vision and the critical eye of the experienced woodsman. Edgar Allan Poe attended the recently opened University of Virginia from February to December of 1826, but few of his compositions date from this period and only one--"A Tale of the Ragged Mountains"--refers specifically to his experience in Charlottesville. Like many of his fellow students, Poe probably had several opportunities to visit what he calls "the chain of wild and dreary hills that lie westward and southward of Charlottesville, and are there dignified by the title of the Ragged Mountains." This landscape forms the basis for his tale of mesmerism, metempsychosis, and animal magnetism.